Mix bleach or hair color as normal before adding PRO-FORCE BONDER 101. Apply the bleach or color mixture to hair and process as normal. When processing is complete, rinse hair and towel dry. DO NOT shampoo. If Bleach application requires a toner, apply toner to the hair at this time and process. Rinse hair and proceed to PRO-FORCE SEALER 102. Apply 10-20 ml or 5-10 pumps of PRO-FORCE SEALER 102 to shaft and ends. Comb carefully to distribute evenly. Process 5 minutes and gently rinse. Proceed with Framesi Color Method Shampoo GO, Mask and Post Color. 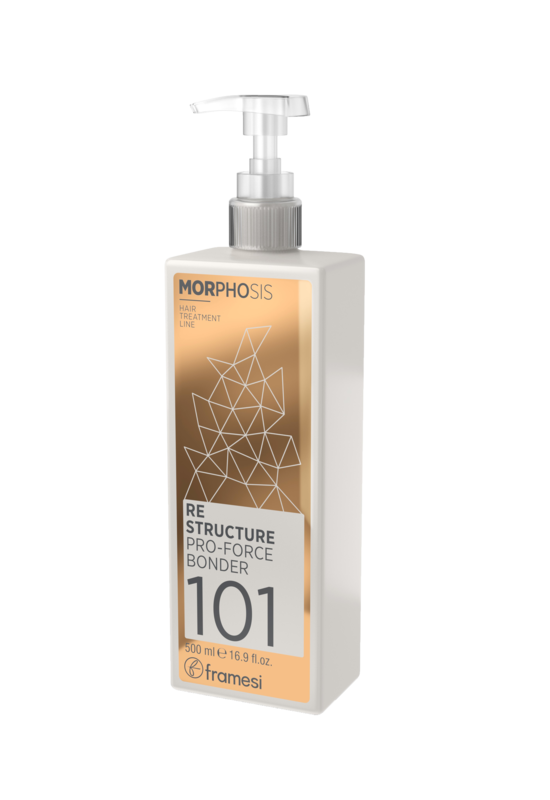 Apply 15-20 ml (½ – ⅔ oz or 8-10 pumps) PRO-FORCE BONDER 101 to shampooed and towel dried hair. Distribute evenly, massaging hair for 2 to 3 minutes. Carefully comb through the hair to spread product uniformly and allow ingredients penetrate. Process for 10 minutes. For extremely damaged hair, process under heat (Do not cover hair with a plastic cap). Rinse well and towel dry hair. Apply 15-20 ml or 8-10 pumps of PRO-FORCE SEALER 102 to hair and distribute evenly. Process 5 minutes and gently rinse. Proceed with styling.